Surgery isn't done unless other methods to treat GERD don't work. After surgery, you may need less or no medicines. GERD symptoms will be greatly reduced. Fundoplication is the most common method. The upper part of the stomach is wrapped around the lower esophageal sphincter (LES). The wrapped stomach applies pressure on the LES. This keeps it closed when it's supposed to be. If you have a hiatal hernia , it can be fixed now. Nissen—An open cut is made. This lets the doctor see the structures that need to be fixed. Laparoscopic—Small cuts are made in the belly. Tubes are placed through the cuts. Tools and a lighted camera are placed through the tubes. The doctor can see on a video screen. Recovery tends to be faster after a laparoscopic procedure. But, it may not work for everyone. An endoscope is passed through the mouth and down to the stomach. Many methods can be used to lower the amount of acid flowing backwards from the stomach. 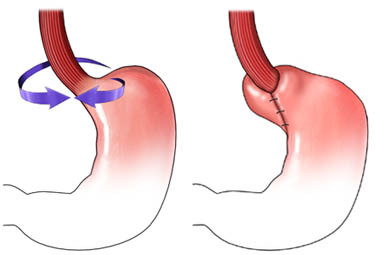 With transoral incisionless fundoplication (TIF), fasteners are used to reshape the upper part of the stomach. This tightens the LES. TIF has a shorter recovery time and is less risky than procedures mentioned above. LINX is a small band with magnetic beads. A laparoscope is used to place the band. It's placed around the outside of the esophagus where it meets the stomach. This band helps the LES work better. The magnets keep the LES closed when it’s supposed to be. Pressure from food or drink coming toward the stomach pushes the beads apart to allow entry. About TIF. GERDHelp website. Available at: https://www.gerdhelp.com/about-tif. Accessed August 20, 2018. Gastroesophageal reflux disease (heartburn). Ohio State University Medical Center website. Available at: https://wexnermedical.osu.edu/digestive-diseases/heartburn. Accessed August 20, 2018.